More than a century after the lightbulb was invented; 1.3 billion people worldwide -- or 18% of the global population and 22% of those living in developing countries -- still lack access to electricity. About 97% of those people live in sub-Saharan Africa and developing Asia, according to the International Energy Agency's 2014 World Energy Outlook report. The high cost of extending electricity grids to rural communities dispersed over large geographical regions means that millions of people are dependent on forms of energy which are unsafe, expensive, and have limited productive capacity. With a mission of creating a future where everyone has access to a plentiful supply of electricity; Powerhive offers hardware and software for smarter microgrids, and is successfully providing villages all over Kenya with solar electricity, battery storage, and real-time response. 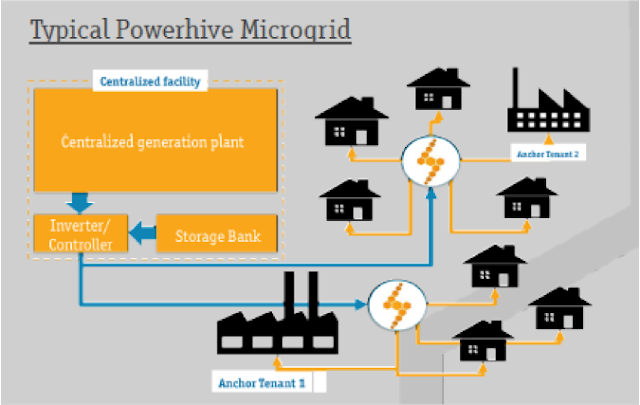 Powerhive is a technology venture founded in 2011 that partner with utilities and independent power producers to provide access to productive, affordable, and reliable microgrids electricity for millions of rural homes and businesses around the globe. Our proprietary technology platform and business model enables the financing, monetization, and management of distributed microgrids solutions. Powerhive started with four pilot projects in Kisii, Kenya, with a total of 80 kilowatts of capacity. The projects served 300 customers, or about 1500 people. Powerhive has the technology for microgrids covered from end to end. First, they use Site Wizard for Analysis, Reconnaissance, and Mapping (SWARM) to identify the markets that could be suitable for microgrids. It looks at satellite imagery and data that has already been collected by other sources to see what locations would generate the most power. Then, a team from Powerhive visits the site to talk to people on the ground and gauge customer interest. Just 23 percent of Kenya’s population had access to electricity in 2010, according to World Bank estimates. The pilot projects reached more than 1,500 people who paid for the energy with their mobile phones, proving the viability of a business model that First Solar and Powerhive now plan to expand. “It will enable us to cost-effectively reach tens of millions of people in rural villages unserved by grids while offering strong risk-weighted returns to investors,” Powerhive Chief Executive Officer Christopher Hornor said in the statement. Kenya has more than 44 million residents. Powerhive offers key tools and services for implementing profitable rural electrification projects in energy access markets around the globe. Their technology platform is ideal for energy providers and developers of any size, and can be integrated with new projects or as a retrofit for existing microgrids. As a complement to our technology platform, our experienced team can assist businesses with every step of development, deployment, and operations. We are the partner of choice for project developers, utilities, government agencies and other organizations that require scalable, profitable electricity solutions in underserved or off-grid areas.